Hello all. 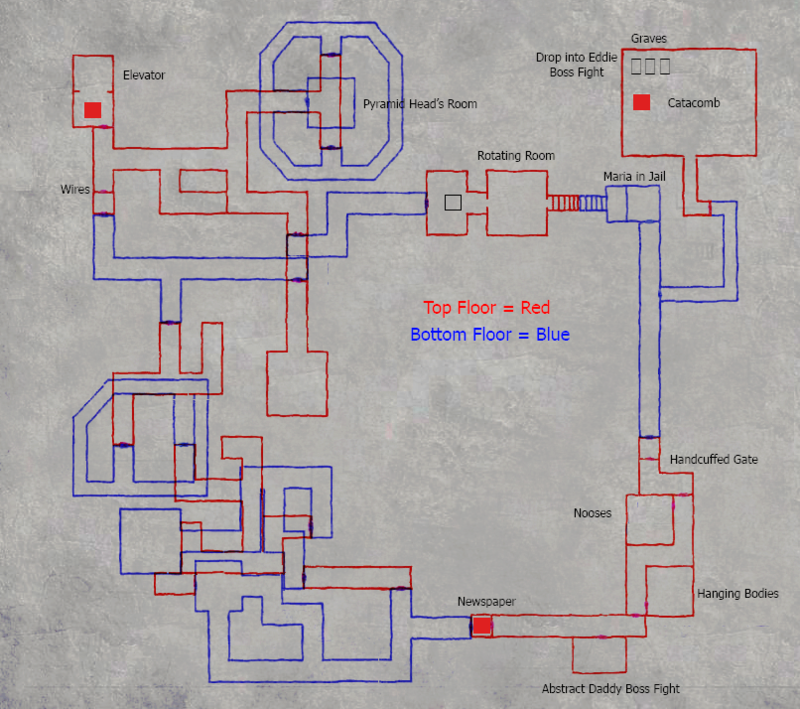 I found this completed map of the Labyrinth and thought I'd post it for you fine folks along with some of my own thoughts about this extremely unsettling section of my favorite game. To be clear, I did not put this together, so my thanks to whoever did. Oh, and unmarked spoilers from here on out. - The most straightforward and clean design in the place is Pyramid Head's area. This could imply that the simplest path for James would be to accept his guilt and punishment. To end the delusion. - Of course, he isn't willing to admit the truth to himself yet, so instead he backtracks and completes a puzzle in which a head is literally turned around (i.e. confused) in order to progress. And where does this lead? - Maria's cell. When we enter from this direction, James meets with yet another obstacle. Meaning more pointless circles he must run in to keep the delusion alive. This is obvious from the most convoluted section of the map, which he has to traverse in order to get back to Maria. - At this point, James' delusion is starting to unravel and he is (I believe) beginning to suspect his true nature. To reflect this, he is presented with someone else in a very similar situation. Someone else drawn to Silent Hill over a dead loved one. Someone who is then revealed to be a murderer. Angela. - Maria dead. After seeing someone else confront their own demons, his own sins are thrown into startling relief, and the embodiment of his lie to himself can no longer sustain itself. - After this, James is shown an obvious parallel between himself and others he knows to be murderers, in the form of graves for Walter Sullivan, Angela Orosco, Eddie Dombrowski, and himself (among others). Jumping into his own grave leads to yet another reveal that Eddie (someone else in his situation) is a killer. So, a picture comes together of James slowly realizing the truth about Mary, his surroundings reflecting his thought process as he progresses. All of that highlights why the Labyrinth is so unnerving and memorable that I'll continue to ramble on about it all these years later. Sorry for the length, but finding this map today stirred up a lot of Silent Hill stuff in my brain, and I thought I'd share. Thoughts? Alternate interpretations? Thinly-veiled personal criticisms? Thanks! Means a lot coming from a forum veteran. I enjoyed the post as well. Definitely makes a lot of sense. Thank you! Another OG forum-er, makes me think there's some traction to this idea. Thinking more about it, I'm wondering what significance, if any, there is to the fact that James meets up with Eddie after the graveyard (graveroom?) instead of in the Labyrinth proper. I'll have to go have a think on it. Also what i would like to add to all the interpretation of the labyrinth part is the texture of the floors. On one side we have the corridors, which look like long appartment floors and on the other side those underground flooded basement ways. I guess this represents somehow James' mind setup. On one hand, althought confusing, his thoughts have structue and there might be logic behind. On the other hand they are just 'a hole in the ground' and also flooded, which could represent an emotional unreasonable way of thinking. It's nice to see the Labyrinth sections merged together in one map. Thanks for the share! The Labyrinth is also called "Nowhere", which is very convenient due to the fact it isn't a direct manifestation of any other physical area. It could literally be James' mind, given the compact outline that we can now see. also James fell ridiculously deep till he reached that "Nowhere". it could be symbolic for going deep into his mind. @VoiDusk: There could be some significance to the two different texture types. 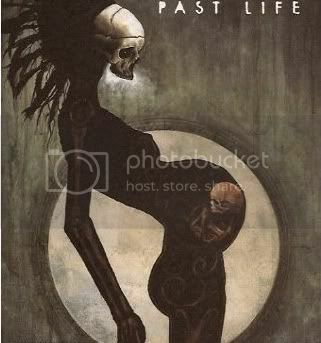 A weird, semi-normal look above (James' demeanor on the surface) and the dark, rotting underground (the truth of what he is). Nice catch! As for jumping down the holes one after another, that's what I was talking about was straining his mind's sense of logic, until it had no choice but to manifest the Labyrinth in order to keep the delusion going. @mikefile: No problem, I thought this place would appreciate being able to see it all put together. I had actually forgotten that it's also called Nowhere. You're right, that's very telling, as his mind obviously isn't a physical location. Interesting stuff. Great post, although I thought James' last chance was the cutscene where he yells at Laura, then blanks out for a few seconds. Also, I think the upper floor of the labyrinth is a distortion of James' apartment. If you look at walls of the labyrinth and compare it to the walls of Mary's room, it's the same. I thought James' last chance was the cutscene where he yells at Laura, then blanks out for a few seconds. The real "moment of truth" (the moment he realizes he killed Mary) is in the hotel. But I see the Labyrinth as the last opportunity for his mind to conceal the truth from itself before he gets there. On some level he is aware of what awaits him on the other side of the lake, and his subconscious is trying it's damndest to stop him before he gets there. That could be why it's a maze. Also, I think the upper floor of the labyrinth is a distortion of James' apartment. If you look at walls of the labyrinth and compare it to the walls of Mary's room, it's the same. Now, that's interesting. I hadn't noticed that. I'll have to take a look at that cutscene again. That also fits with mikefile's observation that it could be a representation of his mind. His apartment would be an important location in his memory, after all. That also fits with mikefile's observation that it could be a representation of his mind. His apartment would be an important location in his memory, after all. Well, not exactly. It would contradict the idea that Nowhere bears no connection to an actual physical location that he remembers of, wouldn't it? And James' apartment is a physical location, afterall. ^ It is a physical location, but one that doesn't belong in Silent Hill. So if the wall textures match Mary's bedroom (and even after looking at them, I'm not totally sure they do), it lines up that as he's beginning to realize what he's done, the site of the murder would be represented. Even if it is a massively distorted version of that place. So I'm not 100% convinced this is what's going on, but it does make some sense. It is a physical location, but one that doesn't belong in Silent Hill. It doesn't really matter. If we take in consideration the hypothesis that Nowhere bears no connection to an actual location that exists in the real world then the Nowhere location in SH2 can't be defined as the distortion of James' apartment, regardless of whether it's located in Silent Hill or not. The original Nowhere had multiple rooms taken from the real world, but still didn't correspond to the real world due to their arrangement. It's unfair to move the goalposts simply because the walls of an unreal maze are taken from James' apartment. ^Exactly. The point is that as a whole you can't reduce it to one specific location. Even if there were mere materials from other locations. Besides, it's also known that the Otherworld tends to recycle various manifested content. the Otherworld tends to recycle various manifested content. the walls of an unreal maze are taken from James' apartment. This is all I really meant. The Labyrinth is obviously not a direct manifestation of his apartment, but it would make sense for elements to be represented there, given it's importance in his memory.